How do Episcopalians celebrate The Blessed Mother Mary? Because we are both Protestant and Catholic, each of us can choose anywhere along the spectrum from not celebrating her at all to venerating her as much more than other saints. As long as we don’t worship Mary as a deity unto herself, we’re good. I have a deep connection to Mother Mary – along with generations of Maria Virginia’s before me, she is the one for whom I’m named, and she’s my muse. Through answered prayer, she gave me the original idea for my blog Saints and Recipes. She appears throughout the archives in her own posts as well as in posts of other saints. She guides my spiritual journey, intercedes on my behalf with her Son, and she instructs the angels to intervene in my life for me. Couldn’t I just say that all this is happening directly between God and me? Yes. Mary, the saints, and the angels can all be considered a part, or the hands, of God. We can ask the saints in heaven to pray for us and see their work in the world, much as we might ask living people to pray for us and be grateful for their actions. So who is Mary, really? Well, if I were to pick the one biblical story that sums up her identity, it would be the Wedding at Cana. Right before Jesus performed his first public miracle of turning water into wine, his mother said to the servants, “Do whatever he tells you.” (John 2:5). She raised him right, encouraged him to take that first step toward his destiny, and then she turned to talk to us, his servants. Significantly, “Do whatever he tells you,” are the last words Mary speaks in the gospels. She’s her Son’s support staff and, especially if we invite her in through prayer, she’s our guide, pointing us always and forever to our Lord and Savior, Jesus Christ. Choose a Mystery as shown below. Begin the five decades of the Rosary in which you pray the Our Father, ten Hail Mary’s and one Glory Be. Repeat four times, one for each decade. As you pray the ten Hail Mary’s, think about each of these Mysteries. Further sources have broken each mystery down into ten scenes that you can recite before each Hail Mary. 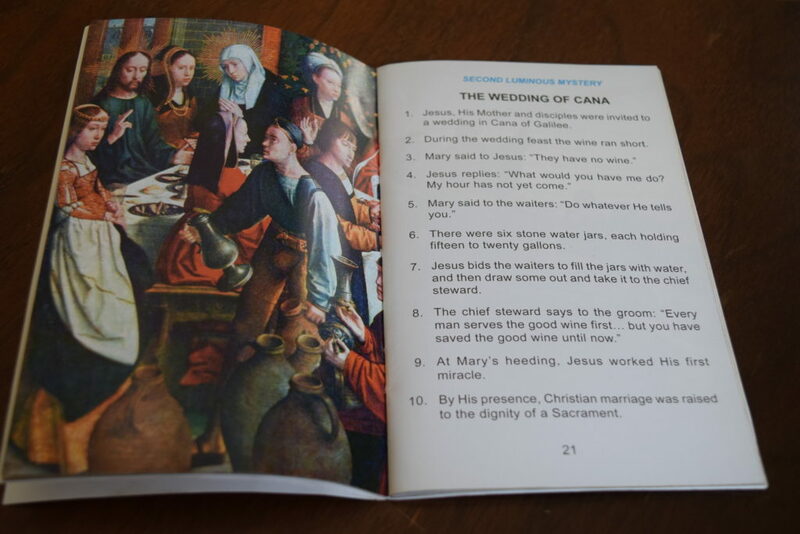 The words of these scenes differ depending on the Rosary book or online source. There are also some sources that show only illustrations depicting each of these scenes in keeping with St. Dominic’s original intention for the Rosary — that it allow those who can’t read a way to regularly contemplate the Life of Jesus Christ through the point of view and help of his mother, the Blessed Virgin Mary. Praying the Rosary is a type of mental exercise because we focus our attention on a particular scene or event and not on the words we’re reciting. It’s also a tactile devotion because the beads help us keep track of where we are and where we are going. Whenever I devote the time and attention needed to pray the Rosary, I feel soothed and at peace. I remain quiet for a while, no internet, music, or conversation. I just listen. And then I hear them — the little and big answers to the questions in my life. With children, I recommend doing The Rosary as two separate activities – 1. Learning to recite the prayers. 2. 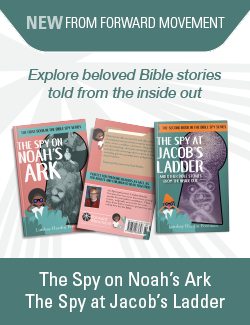 “Reading” an illustrated Rosary prayer book as if it were a picture book. Another way to honor Mary is to remember her presence in our lives simply by carrying a Rosary around in our pockets. I like to encircle a kitchen prayer candle with my Rosary especially when I’m devoting myself to the act of prayerful cooking. 2. In a bowl combine olive oil, garlic, lemon juice, and rosemary. 3. Place chops in a large plastic bag, add marinade, and seal. 4. Place bag in refrigerator overnight or for at least eight hours. 6. Pour a little marinade to heat in a frying pan over medium-high heat. Sear chops for about three minutes on each side. 7. Transfer to oven-safe dish and place in oven for 7 to 10 minutes until internal temperature is 145 degrees when tested with a meat thermometer, or until desired level of doneness. 8. Let chops rest for 5 minutes before serving with roasted potatoes, salad, and steamed vegetables. 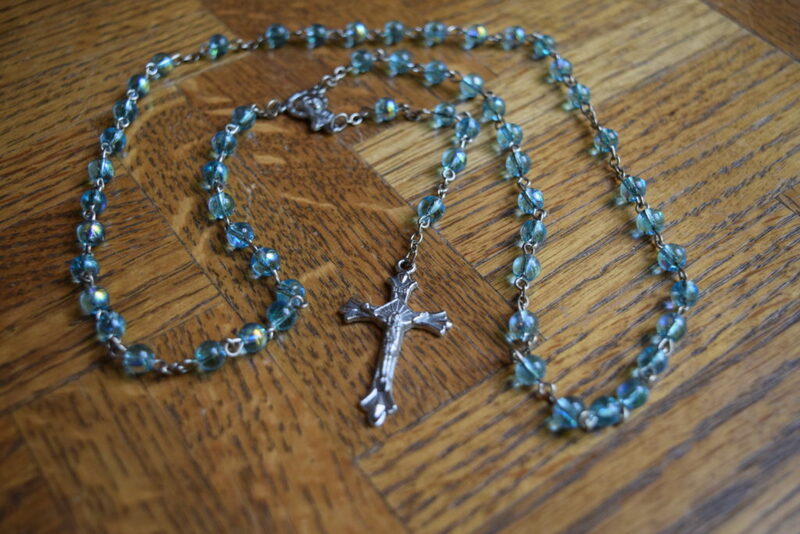 Is praying the rosary meaningful to you? I saw an Episcopal rosary for the first time at Kanuga. The gift shop had several beautiful ones in various sizes. They intrigued me so much, that I bought one, but wasn’t sure how to use it. Your post was very helpful. 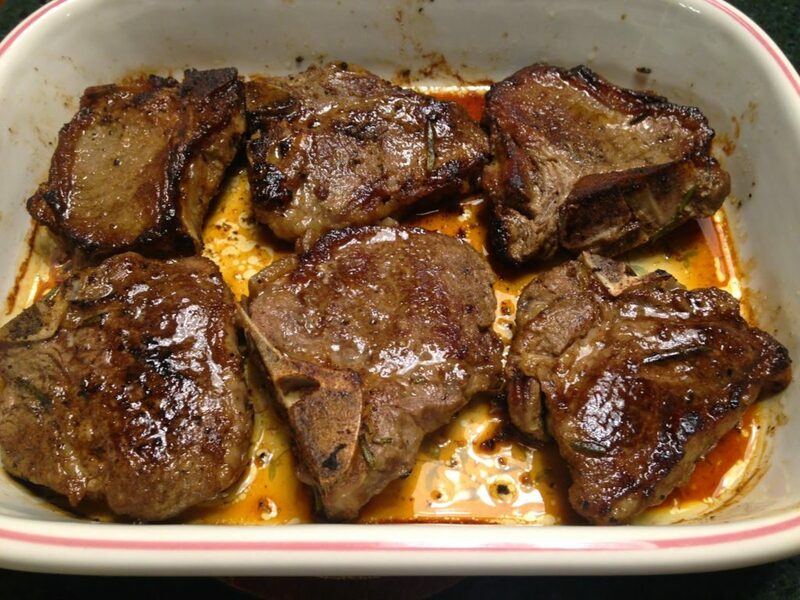 Also, the Lamb Chop recipe looks yummy. I will have to try it!